Circuit Mania - the fun, exciting and engaging way for kids to learn about conductivity, circuits and LED lights. Circuit Mania brings Steam concepts into playtime for children ages 6+. These paper projects help cultivate a host of important skills: problem solving, trial and error, following instructions, and the basics of circuitry and conductivity. Kids can choose their favorite activity or collect them all! It is ideal for any child looking to hang up some eye-catching paper projects around the room or parents searching for a way to mix arts and education. 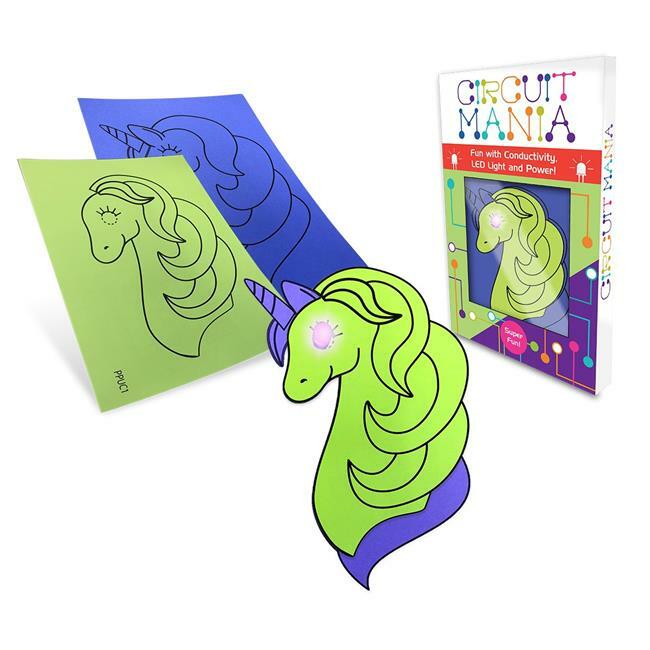 The included step-by-step instructions walk anyone through the process of creating their very own light-up Circuit Mania project. Each pack includes two sheets of different colored paper with outlines, a battery, an LED, strips of conductive tape and a clip.